It's the most glamourous, prestigious and fast-paced competition for businesspeople on the island of Ireland. And as ever, Northern Ireland companies are punching above their weight in the EY Entrepreneur of the Year competition, and six of our businesspeople are contending for the Ireland-wide award. And if they come out on top in the Ireland final on October 23 – which is televised on RTE 1 that evening – one of them will represent Ireland in the global Entrepreneur of the Year Final in Monte Carlo in 2015. They come from a wide range of sectors, encompassing auctioneering, construction, food and engineering. 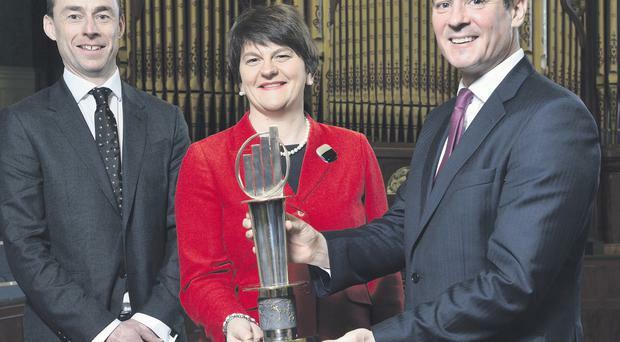 But one thing's for certain – they're all doing Northern Ireland proud. Finalist Ian Haldane leads one of the biggest suppliers to the construction industry in the UK and Ireland, selling everything from roof trusses and timber to kitchens and bathrooms. He is a former pupil of Campbell College in Belfast, and went on to study wood science at Buckinghamshire College. He also completed a two-year international directors programme at the University of Ulster. Before joining the family business, he worked for companies in Scotland, England, Sweden and the US. He became managing director in 1991 after his father John was murdered by the IRA. Since then, Mr Haldane – with the help of his late mother Elizabeth, sister Carol, brother David as well as the board of directors and management team – has grown the company around Ireland, the Isle of Man and England. Haldane Shiells has acquired seven other businesses in recent times. At the outset, it concentrated on native woods but there wasn't enough to meet demand, so instead it started importing wood from Scandinavia, Canada and Russia. It also opened a hardware shop, which continues to thrive. Turnover for 2014 will be around £85m and it employs 450 people. It has around 7,000 accounts in Ireland, England and the Isle of Man. Ian Wilson is the managing director of Wilsons Auctions, and has led the company for over 40 years, becoming owner of the family business in his early twenties. He juggled raising three children with running the business – and now the three Wilson children are all involved in the business. The business is based in Mallusk, Newtownabbey, and was founded in 1936 by Ian's father, William J Wilson. The company works in all areas of auctioneering, from collection to storage, refurbishment and auction – and everything in between. It has auctioned off everything from cars to property, planes and boats. The company has grown far and wide, and opened its second centre in Portadown in the 1987, following that with auction centres in Scotland, Dublin, England and Wales. It even plans to open premises in Spain. It has over 300 full-time staff and another 200 part-timers. Clients are varied – from banks to major companies and government departments. Among their client list are the Home Office, Allied Irish Banks, the Garda, Danske Bank, BMW, Audi and the PSNI. Lorraine Hall and Michael Hall are the owners of Kestrel Foods in Craigavon, which produces dried fruit, nuts and seeds for snacking. Their best known brand is Forest Feast. Mrs Hall is sales and marketing director of the company. Her first job was as a PR and sponsorship executive for drinks company Dillon Bass. She went on to become promotions manager before joining up with her husband to set up Kestrel Foods. Michael Hall founded Kestrel Contract Packers in 1992, operating in off-line contract packing. But the entrance of UK multiples into Northern Ireland reduced demand for the service – so he set up Kestrel Foods instead in 1996. Kestrel Foods bought a factory at Carn Food Park in 2005. Since then the company has doubled in size, with turnover growing by £2.4m in 2014. It is predicting growth of 15% to the end of the 2016 financial year. Export markets have also grown by around 30% – and China and Europe are particularly strong focuses. It has taken on 10 new staff, bringing total employment to 82. The Forest Feast brand is sold in supermarkets and convenience stores across the UK and Ireland – but it's also growing in sectors such as online, food service and travel. The range includes premium exotic fruit, the '£1 pick me up' – and a new gluten-free product called Acti-Snack is aimed at the health, leisure and pharmacy sectors. From food to engineering –Mark Hutchinson is the leader of SJC Hutchinson Engineering, and is now 36. He has brought the company through major growth, and it is now Northern Ireland's main laser cutting manufacturing company, growing from four employees to 85. The company was founded by Mark's father Creighton in 1971 in Kilrea in Co Londonderry. It works in sectors including aerospace, materials handling and coach building. Clients include Wrightbus, McCloskey International, James Leckey Design, Bombardier, Gardner Denver and Sumo. H360 Ltd is a new company set up to design, develop or enhance products. The company said it had taken a "strategic approach to investing in their plant with the highest level of automation to give the company a competitive edge and enable them to diversify into new sectors". It also recently launched Hutchinson AeroTech to focus on manufacturing and engineering for aerospace. The company has set its sights across the world, and is now providing laser cut components for Europe, Middle East, the Far East and Australia. And back to food – Stuart Dobson of Elmgrove Foods, which is part of his father and uncles' Dunbia group, exports beef, lamb and pork offal products to customers in the Far East, Africa and Europe. Finalist Mr Dobson founded the company in 2008, and is a finance and accounting graduate. He also studied farming for a year at Cookstown College. But his work experience also embraces the more rarefied world of fashion – in 2006, he worked as an accountant for a tannery in Florence making leather for design houses like Gucci and Prada. He returned home and became manager of the tripe room for Dunbia, a job which he continues today. Elmgrove Foods now employs 11 full-time staff and has a turnover of £25m. Mr Dobson had realised that many food products from slaughtered cattle, sheep and pigs were being sent to waste. But Mr Dobson found that they could be sent to the marketplace, and has since introduced around 90 products to overseas markets. The company says the ethos of using the entire animal chimes with the Executive's agri-food board's strategy for the sector. It took part in a trade mission to China two years ago, and hopes to be exporting to China within the next five years. The company is known as the market leaders in this sector and the products it has created are copied worldwide. The business exports to the Far East including Vietnam, Hong Kong, the Philippines and Singapore, South and West Africa, the Caribbean and Europe.